I am very happy to share with all of you that I am part of a wonderful new book coming up this summer. I was invited to be part of a group of artists who will share projects made with metal clay and different mediums to add color. 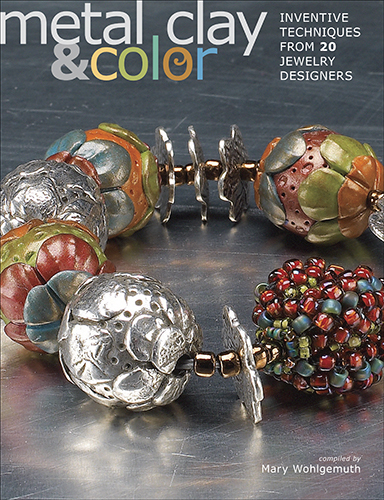 The book's name is Metal Clay & Color by Kalmbach Books and complied by Mary Wohlgemuth. 20 leading artists (Janet Alexander, Lorena Angulo, Lorrene Baum-Davis, Maggie Bergman, Pat Bolgar, Susan Breen Silvy, Barbara Briggs, Sandra Butchko, Catherine Davies Paetz, Pam East, Joy Funnell, Vickie Hallmark, Hadar Jacobson, Patricia Kimle, Irina Miech, Kim Otterbein, Cindy Pankopf, Cindy Silas, Jewelyn Vanoni and Michela Verani ) contributed ideas and projects for adding color to metal clay. I created two projects for the book with bronzclay and added color using Creative paperclay and Gilders Paste, I will also have some images of my work for the gallery. I am sure you will be inspired by the 25 projects included in the book. congratulations!! i will look for this when it comes out! !